This blog post has been a long time coming as I had to write a paper for a super-exciting conference at the University of Virginia which I will be attending next week. (For details see here.) As part of this paper I revisit the familiar medieval figure of Fortune, particularly her wheel. 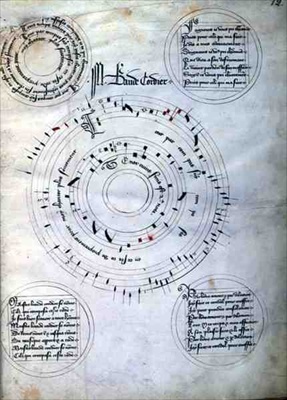 In my paper next week I will argue that the placing of the final group of Machaut items in the Pennsylvania Chansonnier (UPenn 902, viewable here) in fact reverses this wheel by re-using images from the Voir dit and representing them in the new format, often using different lyric items, and in reverse order, thus returning the lovers to their state of anticipation at the start of the tale. This whole thought process, then, is the background to this short reflection on circles and cycles. For now, however, a step back (or ahead, since we are briefly leaving the Middle Ages). 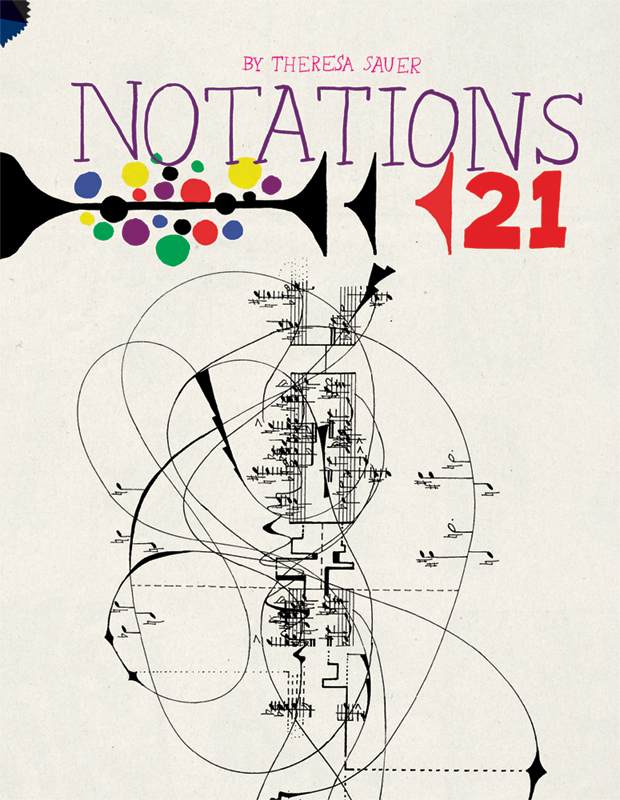 In 2009, the remarkable anthology Notations 21 was published by Mark Batty publishers. It is a collection of graphic scores in honour of the legendary John Cage, specifically marking the 40th anniversary of his own collection entitled ‘Notations’. (The project is ongoing: see notations21.net for more details.) It is, in some ways, a chansonnier, since it contains musical compositions (and additionally works of art inspired by the music), however, all of the works are presented with their creator’s name attached. Interestingly, though, the cover does clearly state ‘By Theresa Sauer’, clearly giving her authority over the collection. Naturally, she is listed as ‘author’ in many of the catalogues in which this book appears. Yet, although being the driving force behind the collection, she is but one of many creative artists whose work it portrays. In scholarly terms, she is closer to an editor, or to a director, than to a book’s ‘author’ in the traditional sense. Yet her name, placed as the highest textual item on the cover, is a striking witness to her involvement in the collection, and not at all unlike the rubric which we saw in the last blog post here invoking Machaut’s authority over one of the manuscripts transmitting his works. Nevertheless, in this book there is one work in particular which draws its inspiration from the form of the circle, or, perhaps more accurately, the cycle. It is entitled ‘Performing Notation, Notation Performing’, and is found on p. 147. Many medievalists will recognise the similarities between the visual presentation of this piece and one of those by Baude Cordier in the celebrated Chantilly codex (Musée Condé ms 564). Both have the structure of one large circle surrounded by four smaller ones. In the Notations 21 piece the principal circle is broken, rolling off into the difference. Cordier’s work is well behaved, enclosed within its page. Both works feature music in the central circle and text in the outer circles, though the piece in Notations 21 has a lengthy prose text within its principal circle. 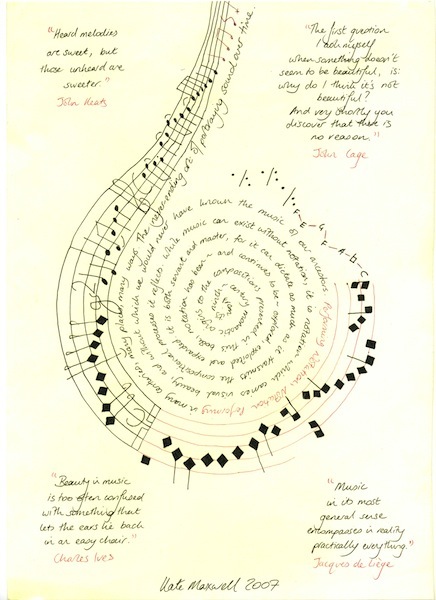 Of the outer circles, those in the Notations 21 piece offer quotations on music – including one from John Cage himself – whereas the small circles in the Cordier piece provide instructions for performance and additional verses. Both pieces make use of a limited colour palette, and present the composer’s name: Cordier’s at the head of the piece, that of ‘Performing Notation, Notation Performing’ somewhat more modestly, yet nevertheless unashamedly, across the bottom of the page. Both works are entirely hand drawn, one on parchment, the other on paper. Now, both are only available to view via the transcoded means of the computer screen or the book page: Notations 21 contains a high-quality reproduction, the Chantilly codex is kept under strict lock and key but is available in facsimile. Indeed, while the ‘original’ codex is indeed still in existence for the Chantilly codex, the French postal system saw to it that Notations 21 is, in fact, the ‘original’ for ‘Performing Notation, Notation Performing’, since the precious piece of paper itself never made it home. Unlike many of the items in Notations 21, ‘Performing Notation, Notation Performing’ contains no explanation, no instructions. This was a deliberate decision, since I preferred to leave any interpretation to performers/readers. What I have said so far in this post is merely what someone with some knowledge of medieval music would be able to infer without too much forethought, and I do not wish to speak as the work’s composer. What follows, then, is written not from the point of view or the composer, but as an interpreter, looking at the work in the light of my current multimodal project. Imagine, then, if you will, a line across the page: any composer’s insider knowledge that may have been present stops here. It is not a great leap of deduction, then, to posit that the use of circles here to present visual music is a nod to music’s natural qualities, that is to say that music is a function of humankind that is not of our making and not entirely of our knowing. Both pieces bend the staves into a circular shape, thus transmorphing that which seeks to contain music to let it speak a new shape, a natural shape. In ‘Performing Notation, Notation Performing’ the broken circle can be seen both as a distortion and an escape: the music escapes from the staves and, indeed, from the page. The notation starts which neumes and moves chronologically through various versions until it can no longer be contained on paper: in the eleven centuries following the invention of musical notation in the West only a minority of music has ever been written down, and collections such as Notations 21 only go to show that the boundaries of the stave are as fragile now as they ever were. But what of the reading path of such images? ‘Performing Notation, Notation Performing’ invites a reading path whereby the more accessible text, that is the text in the margins, is read first, since this does not require turning an unwieldy book or screen (particularly a screen which ‘helpfully’ keeps images the ‘right’ way up when turned). Thus the marginal texts enter the reader’s mind first, and it is having read them – and probably the composer’s name – that the reader will turn to the words which are at the centre of both the page and importance. Finally, the reader may begin to decipher the notation, and decide whether and how the elements of the page should be rendered together, and what to do about the palindromic title. This brief survey of two works has indeed been brief. It has not attempted a detailed analysis of either, merely drawn some links between them and offered some thoughts on circles and cycles. But one of the most intriguing things to have emerged from it, for me, is the link between both the graphic compositions and Fortune’s wheel. 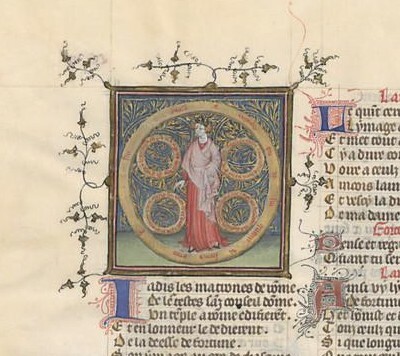 Look again at the miniature from BnF fr. 9221 (Machaut manuscript E) up at the top of the page. See those four circles within the wheel? Yeah, so do I. It seems that Katelijne Schiltz has had something to say about ‘Tout par compas’ and Fortune’s wheel, though I have not yet been able to consult a copy of her article ‘Visual Pictorialism in Renaissance Musical Riddles.’ in Journal of the Alamire Foundation 4:2 (2012), pp. 204–21. I very much doubt that she considers Notations 21 or, indeed, multimodality in the article, however. Nevertheless, if I can undraw that line I put in earlier and speak for a moment as the composer – I did not think of Fortune’s wheel. That is not to say that we can’t see it in there, of course. For that is one of the great delights of multimodal thinking: the onus is put on the reader to re-create the text. In other words, if you want to read ‘Performing Notation, Notation Performing’ as an allegory of Fortune, then that’s fine by me. Or, in a more scholarly working, the background of the reader of any textual being will impose itself on that reader’s re-interpretation of the text, and this does not invalidate that reading. A multimodal reading is not about uncovering hidden (or unhidden) codes sent from creator to receiver; rather, it is about the reader creating the text anew. Like the music escaping from the page in ‘Performing Notation, Notation Performing’, a multimodal interpretation is free from the constraints of author intention or, indeed, faithfulness to authority. In the context of Machaut studies especially, that is a breath of fresh air. L’auteur est mort; vive le lecteur. “Angularity we associate with the inorganic, crystalline world, or with the world of technology, which is a world we have made ourselves” ~ Angles and circles are importantly related in mathematics, aren’t they? which means that intuitively (or unconsciously) and consciously there might be important relationships between angles and circles as well. So for example the sun orbits in a circle and various angles of the sunlight are used to determine time or season. That’s something we might be aware of in an unconscious and a conscious way. I suppose that might be a rational understanding, or way of encountering, a circle, though, mightn’t it. … Well this has given me lots to think about. I don’t know if the “naturalness” of the circle is what makes it so aesthetically pleasing to me, for example (and I was thinking, as I read along, “but circles are just so pretty… why is that..?”).